So… what do we know about Betterware? I’ve always been puzzled as to why when they knock on your door, they ask for their catalogues back. 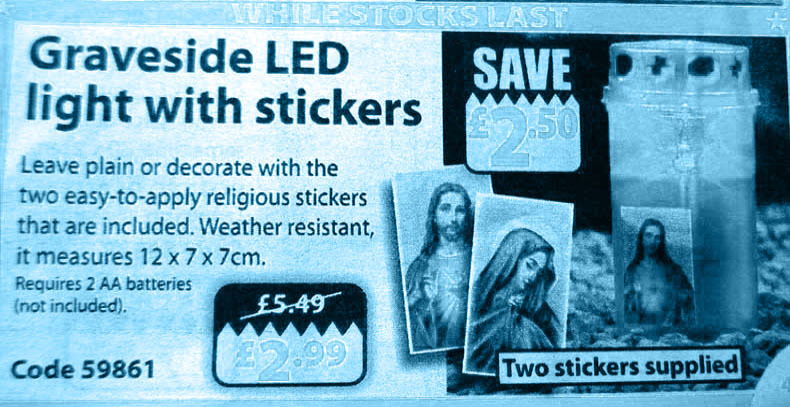 Because they have to pay Betterware for the catalogues as well. The betterware man who came round our street when we were kids was the spitting image of Jimmy Savile, we even called him Jimmy. Quite scary now I think back. Selling shite that we never knew existed. And could now never live without. What do you mean, shite? Who could live without this baby: http://www.betterware.co.uk/catalog/product/view/id/4386/ ? You’ve got me all kerfuffled there Andy – I just can’t work out how two dice are enough for all the date combinations. One die with 0,1,2,3,4,5 and one with 0,1,2,6,7,8 on their respective faces would do (so long as the 6 could be inverted to double for 9). By Jove, @BB, you’re right. They must have picked up two of the first dice by mistake. That being the case, on how many days of the month could one use the calendar, I wonder? Like you haven’t already worked out that in any month of 29, 30 or 31 days there are 12 dates that you couldn’t make, and so one less for a typical February. I worked this out with a biro on the sole of Mrs. Exford’s new slippers. In your letter Andy you could ask for about 40% off I reckon. If you like you could also tell them it’s a very odd tree stump that has side branches coming out that low. @DD – Thanks for doing the heavy lifting but why do both die need to have a 0? If one of these was changed to a 9 it should fettle it. Because (assuming we want to use both dice every day) if only one die had a 0 then you couldn’t have the single-digit dates which appear only on that die – 03,04,05 or 06,07,08. Originally known as Betterwear, but changed to Betterware in 1970.